Oil has crashed close to 20% in the past month as OPEC’s aggressive attempt to drive the US Shale Oil industry into the ground has continued apace. Whether it has other implications for the global economy as a whole is open for debate. There is likely to remain considerable discussion about just what the continuing sharp decline in oil prices means – is it a signal of much slower global economic growth or greater energy supply? Depending on the answer, we either have a significant pressure for lower interest rates or an effective tax cut for global consumers. Stocks tend totrack the price of oil. The last time they diverged like this was in 2007/2008 — and the market crashed shortly after. For the moment, it seems S&P traders are voting this move is a tax cut for global consumers and will aid continuing accomodative monetary policy. But it’s one scary chart. Wow - that is a massive divergence. Something will have to give. Time to watch for top formations and consider put options or short positions in the stocks? Or is it time to look for a bottom formation in oil? Anybodies guess which will go first. Saudi Arabia have said they're not gonna stop over-producing oil even if it drops to $20 a barrel. Other people are predicting the stock market to get flooded with new money due to failing fiat currencies (hyper inflation,quantitative easing,etc). 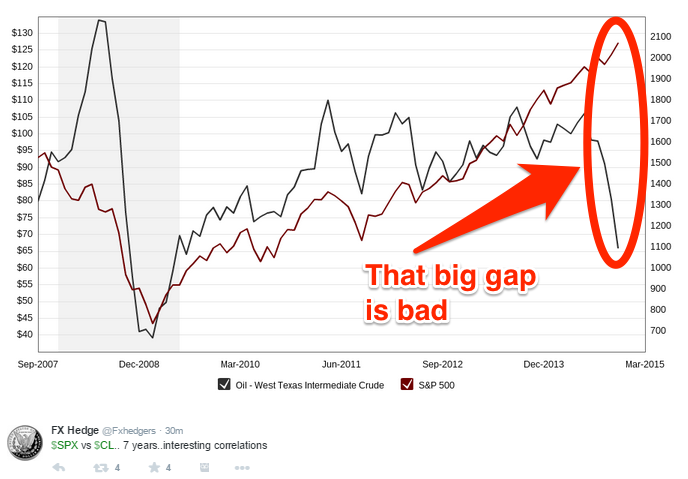 So one story says s&p will continue to rise and the other says oil will continue to fall. But I think we both know that wont last. Whats your opinion on it? A lot of this is being done to devalue russia's currency. The United Nations have got together other and decided it was the best way to have more control Russia. Russia says if they don't stop it there will be world war three and this is what the U.N. wants. Remember wars are moneymakers.